INSIGHT DIALOGUE is a way of bringing the tranquility and insight attained in meditation directly into your interactions with other people. It’s a practice that involves interacting with a partner in a retreat setting or on your own, as a way of accessing a profound kind of insight. Then, you take that insight on into the grind of everyday human interactions. Gregory Kramer has been teaching the practice (which he originated) for more than a decade in retreats around the world. It’s something strikingly new in the world of Buddhist practice - yet it’s completely grounded in traditional Buddhist teaching. 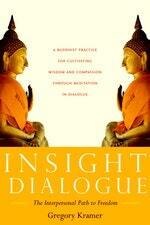 Love Insight Dialogue? Subscribe to Read More to find out about similar books.